Traditional styled and constructed sloop built strong using New Zealand Kauri, Celery Top pine and her hull has been sheathed in Dynel. She offers a spacious cockpit with wheel helm, a cosy saloon capable of accommodating at least six around her drop leaf table and whilst considered to be a four berth boat she can sleep up six. Slipped and antifouled mid 2018 she comes with a very tidy Westerbeke diesel with less than 200hrs and a nice new sail wardrobe. For those looking for a minimal draft she has a very easily operated dagger board taking her sailing draft from 1.65m to 1.02m. 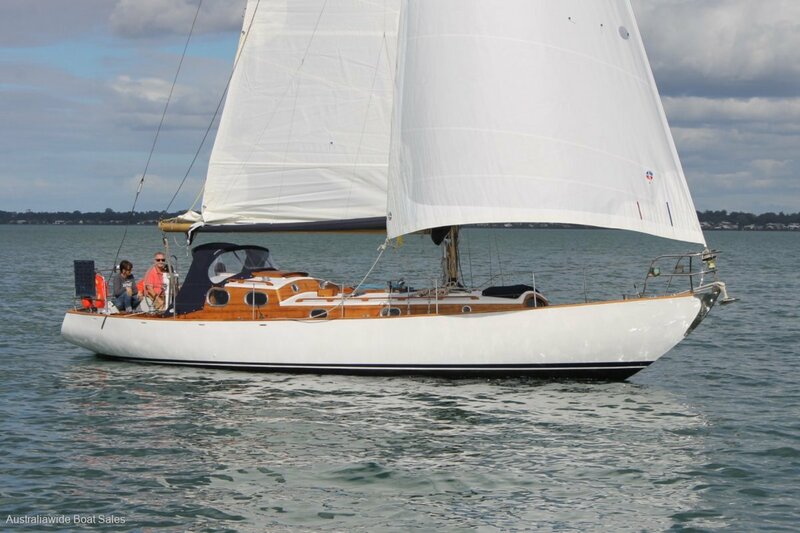 We're impressed with her polite sailing manner and easy of handling and would suit the short handed sailer looking for that classic style. A pretty boat certain to not only turn your head but capture your heart. Timber - Kauri and fibreglassed over in Dynel woven cloth. Teak decks, Celery Top Pine cabin tops and trim. 35hp Westerbeke 3 cylinder diesel installed new in 2010 and in excellent condition. Shaft drive, two blade folding prop. 50 litre stainless steel tank. 150 litres via 100 litre bladder and 50 litre tank. Comprising of a Tudor gas cooker with oven, stainless steel sink and top loading refrigerator. The saloon offers two quarter berths either side of the companionway followed by galley and nav area. Amid ships is the dining area with drop leaf table and two settees. Forward of the bulkhead is the enclosed heads with vanity and storage opposite with a V berth in the fore peak. Good natural light, a large hatch for ventilation, an abundance of polished timber and nice upholstery. Headroom to the galley is 190cm and reduces to 183cm forward. 4 dedicated berths but capable of sleeping 6. Manual marine toilet with holding tank. Dodger, hatch cover, main sail boom bag and complete boat cover. 40lb Manson anchor, 50m of galvanise chain to a Maxwell 1500 electric capstan with foot control and cockpit remote. 4 x PFD type 1 life jackets, safety hardness, 2 horse shoe life floats, fire extinguisher, fire blanket, manual and electric bilge pumps. 1 x start & 1 x house batteries rotary isolation switch, CTek MX7.0 portable battery charger, inverter, solar panel. Garmin Echomap 50DV GPS / plotter, Raymarine wind display, GME GX548 VHF. Masthead sloop rig, keel stepped mast, alloy spars, two pair of inline spreaders, 1/19 stainless steel rigging. Exact age of rigging is unknown. Wheel helm, timber grab rails, dorades, timber cap rail, stainless steel pushpit and pulpit, bow roller, timber mooring cleats, removable boarding ladder, fenders and mooring lines. Antifouled and surveyed June 2018 - report is available for inspection.